On September 5, the Omron Corporation unveiled smile recognition software that promises to improve the ability of machines to read human emotions. 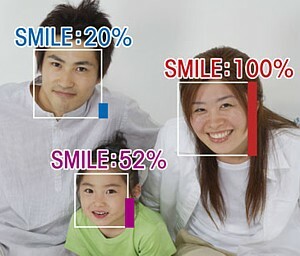 Built around Omron's previous face recognition technology, the new "OKAO Vision Real-time Smile Measurement Technology" is designed to automatically identify faces in digital images and assign each corresponding smile a score of 0% to 100%. The system works by automatically fitting a 3D face model onto the subject's face and analyzing a number of key points, such as the degree to which the eyes and mouth are open, the shape of wrinkles at the edges of the eyes and mouth, and changes in the position of facial features. The entire process, from the time an image is input until the time the smile score is output, takes 0.044 second (for a 3.2 GHz Pentium 4 processor). OKAO Vision can analyze multiple faces simultaneously as long as they are at least 60 pixels wide and facing the camera (tilted less than 30 degrees to either side and less than 15 degrees up or down), and the software does not require faces to be registered beforehand. OKAO Vision, which Omron says is more than 90% accurate, was developed by studying the facial expressions of 15,000 individuals ranging from infants to the elderly, from a variety of countries. The 46-KB, Windows 2000/XP-compatible program can easily be incorporated into a variety of devices, say the developers, who hope to see it put to use in digital cameras designed to capture the perfect smile, or in robots that can recognize when humans are happy. Masato Kawade, OKAO project leader, says he hopes the technology "can contribute to the development of an ideal society where machines operate in harmony with human emotions." Omron plans to release the new OKAO Vision system later this year, making it the latest addition to a line of face recognition technology that boasts features such as the ability to determine a subject's age, gender and line of sight. In the future, the company plans to shift the focus away from shiny, happy people and develop technology that can read faces for anger and sadness. Where can I get this software. Please provide me the download link for which I shall be very thankful to you.